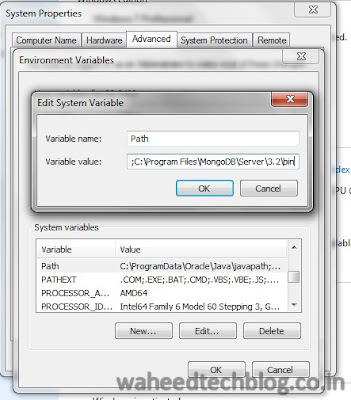 Tech Blog: How to install and verify MongoDB on Windows 7 ? Check MongoDB msi from Official website and download Windows Server 2008 R2 64-bit and later version. Double click on downloaded MSI (mongodb-win32-x86_64-2008plus-ssl-3.2.11-signed.msi) file and follow the click on next button on wizard to complete the installation. MongoDB requires a data directory to store all data and its default data directory path is \data\db. 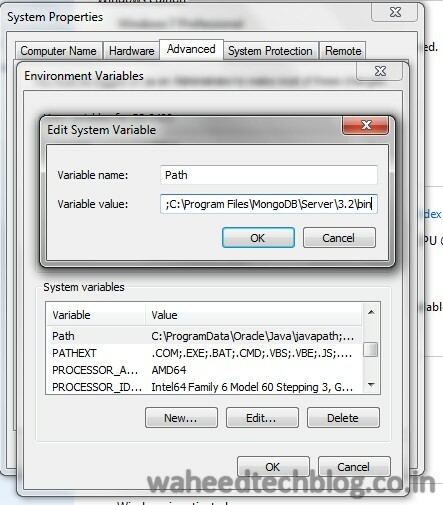 Set MongoDB location to system's environment variables and give path till bin folder. To start MongoDB server, Open cmd and type mongod, it will start the MongoDb server on port -27017. We can create a config file where we can add the custom path of data/db directory, Config file will be similar to properties file and add attributes in key/value pair. Use mongod.exe –config E:/mongodb/mongo.config to load config file while starting mongodb2. We can start mongoDB as a service, Adding MongoDB as Windows Service will start MongoDB automatically following each system restart. Install as Windows Service with --install.